STOCKS: US markets closed lower on Wednesday, weighed on by some relatively hawkish signals from the Fed and media reports suggesting the US will likely proceed with slapping tariffs on China tomorrow. The Dow Jones and S&P 500 dropped by 0.47% and 0.40% respectively, while the Nasdaq Composite was more resilient, declining only by 0.11%. Futures tracking the Dow, S&P, and Nasdaq 100 suggest these indices are likely to open lower today as well. Asia was also a sea of red on Thursday. Japan’s Nikkei 225 and Topix fell 0.99% and 0.92% correspondingly, while in Hong Kong, the Hang Seng tumbled by 1.17%. The pessimism looks set to roll over into European trading as well, as futures indicate that all the major indices are set to open notably lower. COMMODITIES: In energy markets, oil prices are lower on Thursday, giving back some of the gains they posted yesterday on the back of bullish EIA inventory data. WTI is down by less than 0.1% today, while Brent is trading nearly 0.4% lower. More broadly, focus remains on how major producers will act at next week’s OPEC meeting, with headlines yesterday suggesting Saudi Arabia is considering a range of options regarding how much to raise output and over what timeframe. In precious metals, gold is trading 0.1% higher today, currently hovering just above the $1,302 mark. Prices rose yesterday in the aftermath of the Fed gathering as the dollar lost ground, but the gains were short of impressive and the metal remains stuck in the narrow range it has established in recent weeks. The Fed raised interested rates for a second time this year yesterday, as was widely anticipated, and revised higher its rate-path projections for 2018 to signal four rate increases in total, from three previously. The so-called “dot plot” indicated that now eight policymakers anticipate at least four hikes in 2018, in contrast to seven members back in March. In other words, one official raised their “dot” as she/he became more optimistic on the outlook, which was enough to push the median “dot” higher. In terms of economic forecasts, all changes were hawkish. The unemployment rate for 2018 was revised lower, while the forecasts for GDP growth and the core PCE price index for the year were raised slightly. 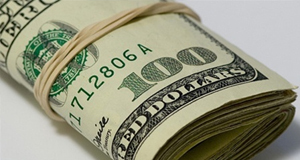 The dollar strengthened immediately on the decision, but the surge was short-lived. The US currency started to give back its gains to trade even lower in the following minutes, after Fed Chairman Powell stepped up to the rostrum and downplayed these hawkish signals. He noted it is “too soon to declare victory on inflation”, and that although inflation is likely to run above 2% in the coming months due to higher oil prices, the Committee will not overreact to such an overshoot. Also of interest, he announced the Fed will hold a press conference at every meeting from January onwards. The key takeaway was that the US economic picture continues to improve, and that if things play out as projected, it wouldn’t be surprising to see another two rate hikes this year, likely in September and December. That comes with a caveat though; it’s still a close call whether the Fed will deliver as many hikes as its “dot plot” now suggests – remember that just one official raised their projection, and that person may not even hold voting rights this year. Reflecting this uncertainty, markets have fully priced in one more 25bps hike for 2018, but see only a 44% probability for a second one. On the trade front, media reports suggest the US will proceed with slapping tariffs on $50bn Chinese imports. The announcement is due on Friday and is likely to provoke a symmetrical retaliation from Beijing, potentially reigniting fears of a trade war and unleashing another wave of risk aversion. Indeed, markets seem to be gearing up for such an escalation, as safe-haven currencies like the yen and Swiss franc are higher today, while Asian stock indices are lower. Elsewhere, aussie/dollar is down by nearly 0.35% on Thursday, after Australia’s employment data for May were a touch softer than anticipated. Softer-than-expected Chinese data overnight relating to retail sales, fixed asset investment, and industrial output may have contributed to the slide in the aussie and Asian stocks as well. The conclusion of the European Central Bank’s meeting on monetary policy is the highlight out of Thursday’s calendar. Retail sales data out of the US and the UK are also of importance though and are anticipated to lead to positioning in FX markets. Krona pairs will be in focus at 0730 GMT as Sweden sees the release of inflation figures for May. UK retail sales data for the month of May will be hitting the markets at 0830 GMT. Both headline, as well as the core measure of sales that excludes fuel, are anticipated to grow at a faster pace annually and slow down on a monthly basis relative to April. The odds for an August rate hike by the Bank of England currently run at 41% according to UK overnight index swaps; a data beat can stoke those expectations, supporting sterling, and vice versa. The ECB’s rate decision is due at 1145 GMT. No change in rates is expected, with market attention turning on the outcome of policymakers’ discussion on the timing of putting an end to the Bank’s asset purchase programme. If for example the central bank makes an announcement on ending the programme by year-end, then the euro is expected to appreciate. Mario Draghi’s press conference will commence at 1230 GMT. If one were to extrapolate from past conferences, market sensitive comments are “on the agenda”. 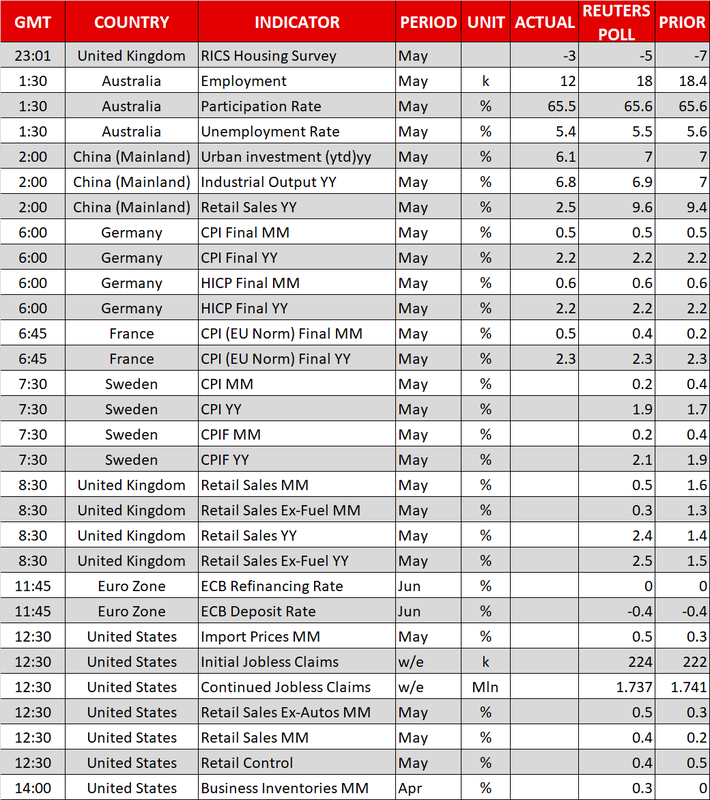 The US will be on the receiving end of retail sales data for May at 1230 GMT. Sales are expected to grow by 0.4% m/m in May, double April’s growth rate. Meanwhile, the measure of sales that excludes automobiles – core retail sales – is projected to expand by 0.5% on a monthly basis, after rising by 0.3% in April. Other figures that will be made public out of the world’s largest economy at the same time are retail control and weekly jobless claims data, as well as May’s numbers on import and export prices. Lastly, US business inventories for April are slated for release at 1400 GMT. On the trade front, it appears that US officials – President Trump and his top trade advisors – are debating whether they should push forward with $50 billion of tariffs on Chinese imported goods. Such an outcome is likely to lead to escalating tensions, consequently weighing on sentiment and boosting safe-haven perceived assets to the detriment of riskier ones. Following this week’s US-North Korea summit and after meeting his Japanese and South Korean counterparts, US Secretary of State Mike Pompeo will today be heading to Beijing to discuss bilateral as well as broader international issues. EURGBP is trading roughly 20 pips below last week’s five-week high of 0.8837. The RSI continues rising having entered bullish territory, though it is only moderately positively-sloped at the moment. This points to the existence of bullish momentum, albeit only moderately so. A hawkish ECB is anticipated to boost the pair. 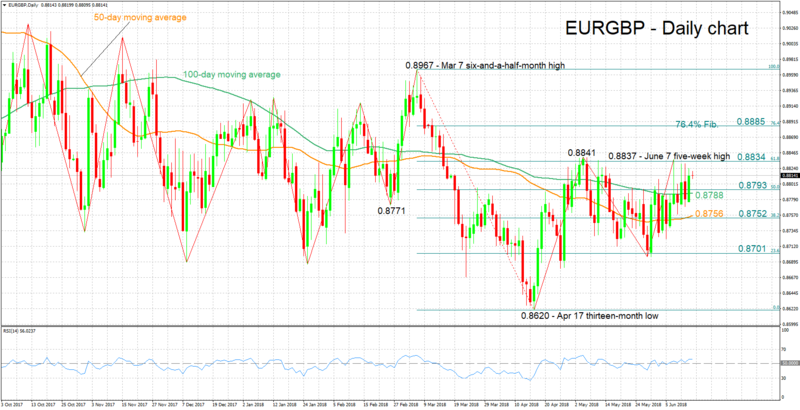 Resistance to gains could come around the 61.8% Fibonacci retracement level of the March 7 to April 17 downleg at 0.8834; last week’s peak at 0.8837, as well as a three-month high of 0.8841 from early May are also part of the area around this level. An upside break would turn the attention to the 76.4% Fibonacci mark at 0.8885. On the other hand, a dovish message by the ECB is likely to push EURGBP lower. Support could come around the 50% Fibonacci at 0.8793, including the 0.88 handle and the current level of the 100-day moving average at 0.8788. The region around the 38.2% Fibonacci mark at 0.8752 that also encapsulates the 50-day MA at 0.8756 would be eyed next in case of steeper losses. UK retail sales are also expected to move the pair.